Will you help us win $100,000? 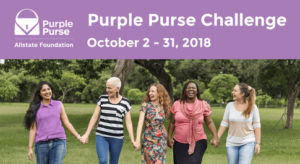 WRC is excited to announce that we have been selected to be part of Allstate Foundation’s Purple Purse Challenge this year. It is the 5th year the foundation has put together a fundraising challenge for Domestic Violence agencies across the country to participate in. The #PurplePurse has officially launched and we are looking to you for help. We need our supporters to give as much as they can each week so we can win the grand prize of $100,000. As part of the challenge, each week the Allstate Foundation has a bonus prize available to each division. This gives us the opportunity to win even more cash! Week 1: Every $1,000 raised online is one entry to win $2,500. Week 2: The 4 organizations that raise the most online this week will each win $5,000. Week 3: The 3 organizations with the most (unique) online donors this week will each win $5,000. Week 4: The 5 organizations that raise the most online this week will each win $3,000. To make this fundraising challenge even more exciting tennis pro, new mother, and fashion designer Serena Williams has joined as an ambassador. he 2018 Allstate Foundation purple purse is a backpack designed by tennis champion and Purple Purse program ambassador Serena Williams, with all women in mind. At 11 inches wide, 15 inches tall and 5 inches deep, the backpack can carry all of a woman’s necessities while making no sacrifice when it comes to style as it transitions seamlessly from daytime to evening. To complement its silver zippers and accents, the front of the leather and suede backpack features a custom silver inscription, “Serena Williams for Purple Purse.” Produced in extremely limited quantities, the estimated retail value of the bag is $350. For every $20 donation you receive one entry into WRC’s purse raffle. Each week the Allstate Foundation will be choosing from those who have donated $10 to win one of their purses. A $20 donation is 3 chances at a purse, those are great odds! Together we are changing lives. Thank you for your support.